As one of the first apps to be ready for the new Apple Watch, ViewRanger is again putting active outdoor navigation on our wrists: this time those of Apple fans. A simple glance at Viewranger running on the Apple Watch will provide information on where you are and where you are going, without needing to fish the iPhone out of your pocket. This includes directions for navigation such as your current coordinates, altitude, heading, plus distance to the next waypoint, point of interest, or to the end of the route. It is also possible to review information about your trip such as the duration, distance travelled and height gained and lost. As with other smartwatches, this is not an attempt to replicate the smartphone experience, instead it offers a new way to access time-sensitive information that will appeal in particular to people out cycling or walking or engaging in any outdoor activity where you need to keep your hands free. Using the Apple Watch, you can view key navigation alerts at a glance, and consult the map on your iPhone if required. It is also easy to start recording or tracking every adventure, with pause and restart functionality, keeping the iPhone safely out of harm’s way. 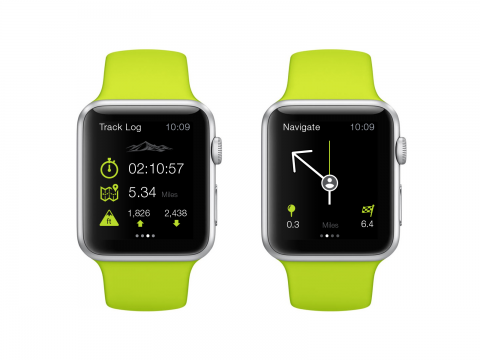 The Apple Watch aimed at outdoor enthusiasts is the Sport collection. The watch's case is made from lightweight anodised aluminium in silver and space grey, and the display is protected by strengthened Ion-X glass, making it a bit more outdoors-proof. It is splash and water resistant, but not waterproof. 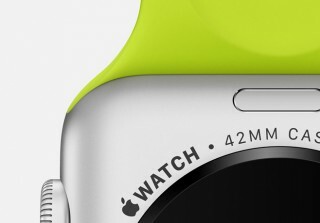 Apple Watch is due to ship on 24th April, with preorders taken from 10th April.